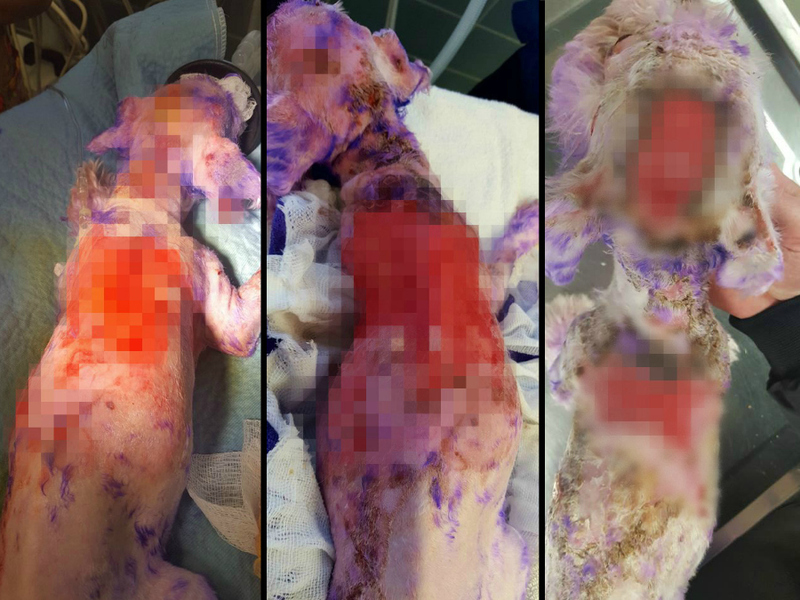 PINELLAS COUNTY, Fla. — Pinellas County Animal Services is sharing a disturbing story to warn pet owners of the dangers of using human hair dye on pets. 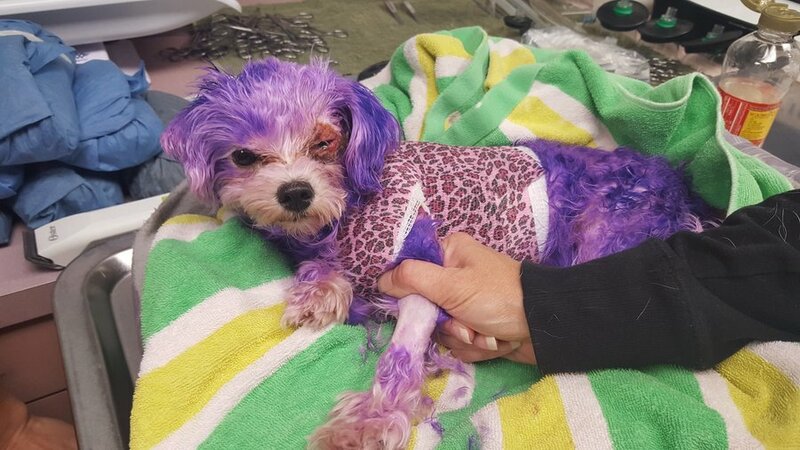 Violet, a 5-pound white Maltese mix, is currently recovering after receiving extensive chemical burns from purple hair dye. Most of the photos of her injuries are so graphic , we cannot show you. According to animal services, Violet was dyed with a purple hair dye that was intended for humans. As a result, Violet’s eyes were swollen shut, she was limp and listless and she had burns to her skin. The burns were so severe that she lost several layers of skin and veterinarians didn't think she would survive. Animal services gave her fluids, pain meds and gently washed as much of the chemical dye off as they could before bandaging her up. "Then we waited – Violet went home with our veterinarian and we waited. And she came in the next morning and we were amazed that she had made it through the night. But still we waited. She wasn’t out of the woods but she was alert and freely offering kisses," Pinellas County Animal Services posted on Facebook. Once they began to shave off her hair, they were able to really measure the damage. "To our horror, her skin began to slough off," the post reads. "It was so much worse than we initially thought – how would this little dog make it through?!?!" 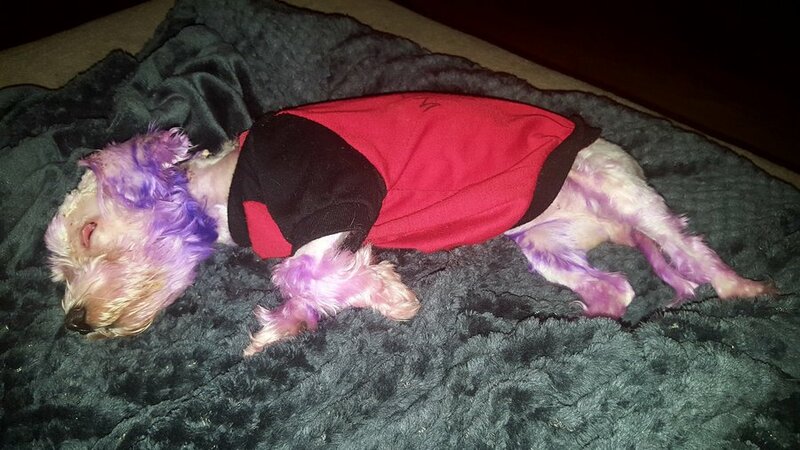 After pain medication, antibiotics, IV fluids, honey treatments, scab removal, anesthetizing, bandage changes and tireless work by animal services employees, today, three months after the hair dye, veterinarians say Violet is making a miracle recovery. "Still, we worried – Did she have permanent blindness? Would there be infection? Would her hair ever grow back? Was there anything we were missing? When the final badges came off we breathed a collective sigh of relief – Violet was beautiful." "Please take one thing away from Violet’s journey," Pinellas County Animal Services pleaded. "Only use products specifically meant for pets or you could be putting your pet’s life on the line." Professional dog groomer Tracey Hubbell of Earthwise Pet Supply is one of many groomers who safely dyes dog's fur. Hubbell only uses animal safe products and tests the dye on small areas to make sure the dog does not have an adverse reaction. "It's really fun. It adds a pop of color, and if it's done safe, it's excellent," Hubbell added. ABC Action News found out the Pinellas County Animal Services team is actively searching for the person who doused Violet in unsafe dye and left her to die. Charges will be filed if that person is located. Meanwhile, Violet has been adopted. 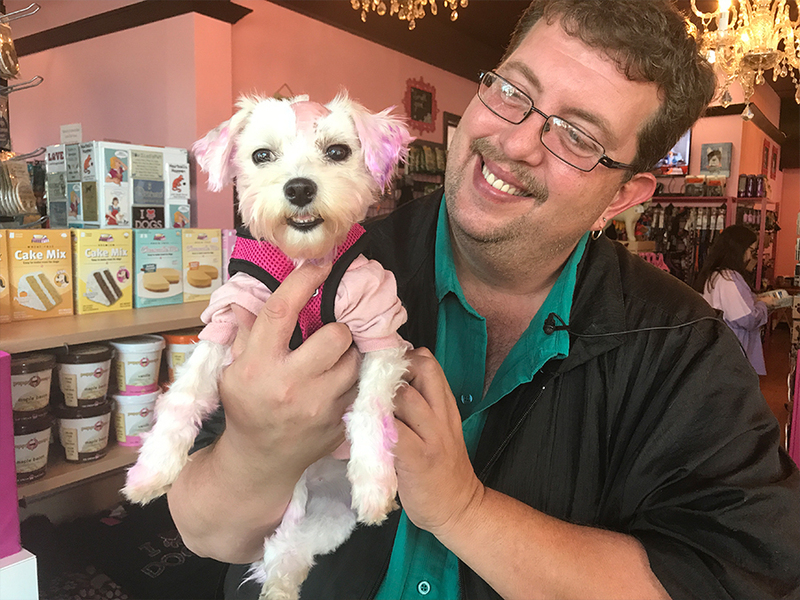 David Anderson, a Dunedin resident and dog groomer at Woof Gang Bakery and Grooming salon in St. Pete, has welcomed the pup into his family. "She’s a pistol. She’s the life of the party. It's amazing how she loves everybody and knows no strangers, despite how she was treated," he said while Violet gave him a kiss.